Printing Mistake – Going Against the Grain! Grain direction can made a big difference as to how the paper reacts when it’s folded, scored or bound. The quality of your printed product depends on being knowledgeable about paper grain… and not “going against the grain”! Paper grain is the direction the fibers in the paper lie. When paper is being produced, fibers will tend to go in one direction or other. “Grain short” is when the grain lies parallel to the paper’s short side and “grain long” is when the fibers lie parallel to the long side. It depends on how the paper’s cut in the factory. Usually a 8.5″ x 11″ sheet of paper’s grain is the 11″ or the “grain long. (the fibers are parallel in the 11”). Papers cut in “grain short” have most of the fibers pointing across the 8.5″ direction. The easiest way to know the grain direction is to order it in the direction you need, either long or short. 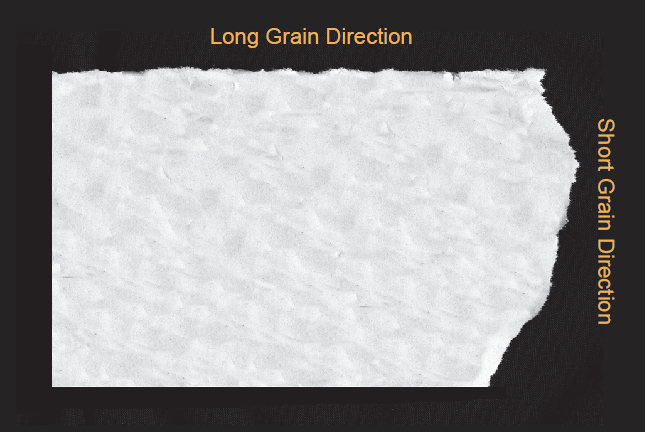 Paper mills Usually indicate paper grain on their labels in words like “Grain Long” or “Grain Short.” Dimensions may also indicate the lie of the grain: 8.5 x 11 is long grain and 11 x 17 indicates short grain. Paper should be folded parallel to the grain’s direction. If paper is folded against the grain the fold may be rough or even crack along the folded edge. Cracking is likely to occur with heavier paper and should always be “scored” (creased) before folding. Take a piece of paper and tear it both vertically and horizontally. Tears with the paper grain will be easier and also relatively straight because you’re tearing with the aligned fibers. Tears against the paper grain will be more difficult and the tear will be more jagged. The grain of the paper should be parallel to the folded edge of a signature booklet. 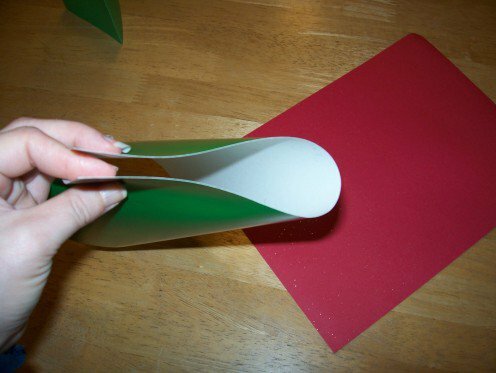 Don’t mix long and short grain paper or the booklet will have uneven or stepped edges when trimmed. 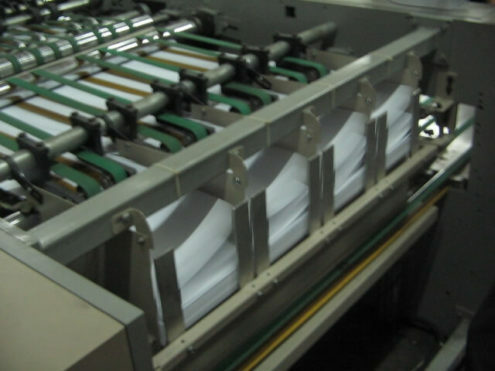 Paper fibers constantly contract and expand due to the glues and moisture conditions in the binding process. Because of this it’s important to make sure the paper grain on all the pages is parallel to the book binding edge. Don’t mix grain direction in the pages or you may have these problems: pages are wavy or resist turning, the binding edge is bulky, pages may flare out or the book “snaps closed” when you try to open it. Grain direction is extremely important when heavier papers (more than 120g/m2) are run through a copier or printer. Grain direction MUST BE parallel to the lead edge of the paper when it’s loaded into the copier trays. Production errors can thus be avoided by having some knowledge of grain direction before actual printing. Previously: Happy 4th of July! !